Signed "J.L. 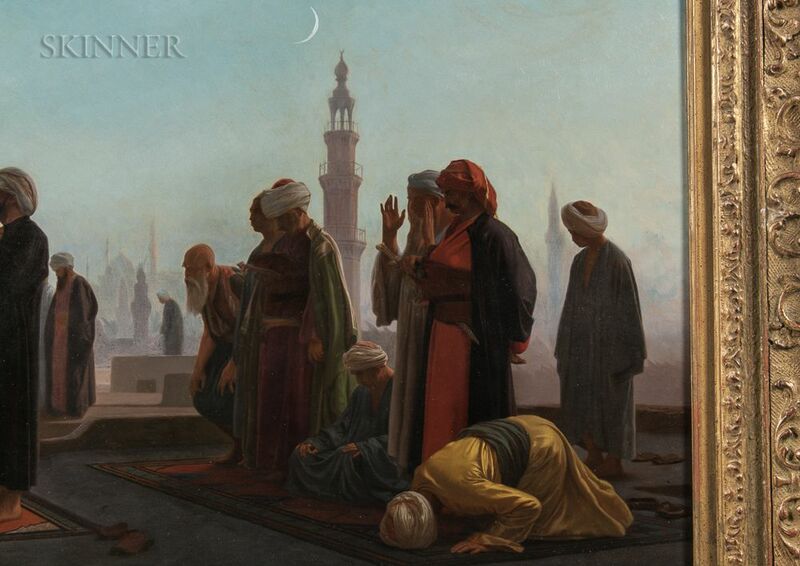 GEROME" c.l. 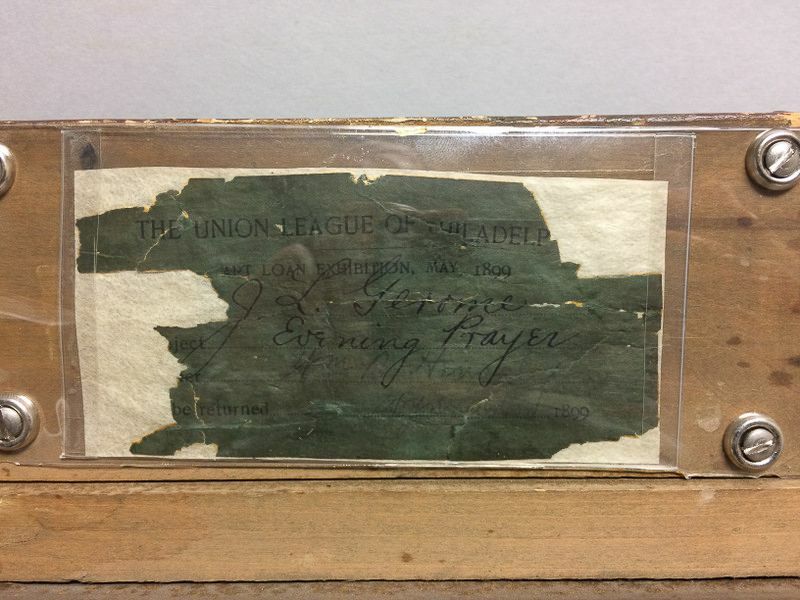 along the edge of the wall of the roof, identified on a presentation plaque and on an encapsulated exhibition label from the Union League of Philadelphia (see below) affixed to the back of the frame, "BVC -19240-" inscribed in black ink across the center horizontal bar, and with a gummed label with the typed number "H-513" also on the back of the panel. Oil on cradled mahogany panel, 19 1/2 x 31 7/8 in. (49.5 x 81.0 cm), framed. Condition: Minor dots of retouch to sky, retouch to edges to cover frame abrasion, a treatment report from the Art Conservation Department, Buffalo State College, accompanies the lot. 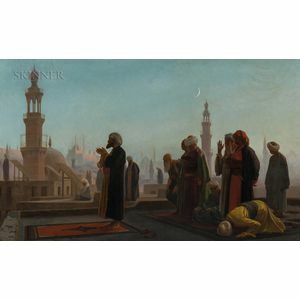 Provenance: Sam Mendel (1814-1884), Manchester, UK, from at least 1 July 1870 until 22 September 1873 (known as Prayer at Cairo); Agnew's, London, from 22 September 1873 until 29 October 1873 (sold as Prayer at Cairo); to Henry William Ferdinand Bolckow (1806-1878), Middlesbrough, UK, in October, 1873 (known as Prayer in the East); by descent to Mrs. Henry William Ferdinand Bolckow in 1878; to Christie, Manson and Woods, London, Modern Pictures, May 5, 1888, as Lot 18 (sold as Prayer in the East); purchased from above by Goupil; to Boussod, Valadon & Cie. ("BVC - 19240") (sold as Prayer in the East); purchased from Boussod, Valadon & Cie. in New York by William P. Henszey (1832-1909), Wynnewood, Montgomery County, Pennsylvania, on September 28, 1889 (known as Evening Prayer); through to M.M. Pochapin, President, Art Movement, Inc., New York (as Evening Prayer); purchased by W.G. Dickenson, Lockport, New York, March 16, 1945, from the National Hall of Art, Art Movement, Inc. (as Evening Prayer); then by descent. Exhibitions: Royal Mining, Engineering, and Industrial Exhibition (International and Colonial), Newcastle-upon-Tyne, United Kingdom, 1887 (no. 905, as Prayer in the East), lent by Henry William Ferdinand Bolckow; Union League of Philadelphia, Loan Exhibition of Paintings by Eminent Artists Belonging to a few Citizens of Philadelphia, May 11-27, 1893 (no. 58, as Evening Prayer), lent by William P. Henszey; Union League of Philadelphia, Art Loan Exhibition, May 11-27, 1899 (no. 67, as Evening Prayer), lent by William P. Henszey. N.B. 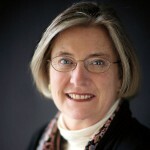 A letter of authentication from Emily M. Weeks, Ph.D. will accompany the work. The painting will also be included in Dr. Weeks's revision of the artist's catalogue raisonné. We would like to thank Dr. Weeks for preparing the catalog note that follows immediately below. 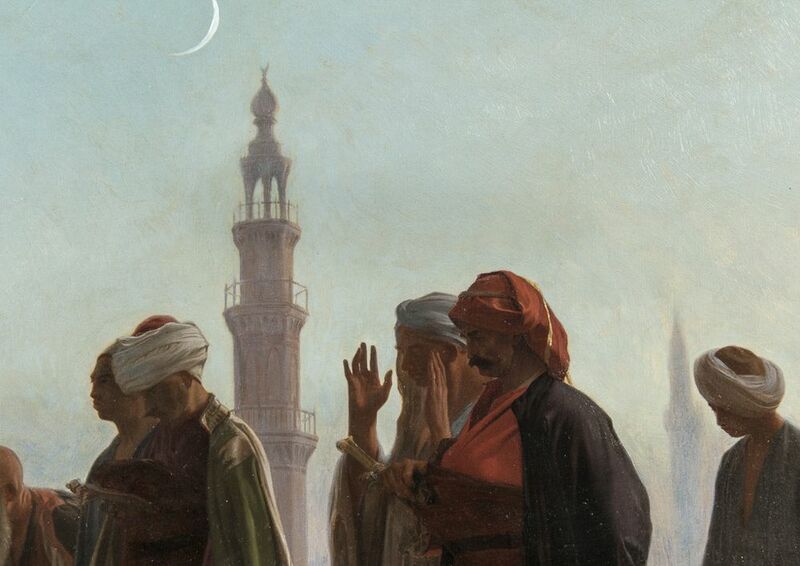 Gérôme's path to Orientalism began in 1856, when he traveled to Egypt for the first time. (Earlier in his career, he had made his name with light-hearted Néo-Grec genre scenes and archaeologically exacting images of the classical past.) 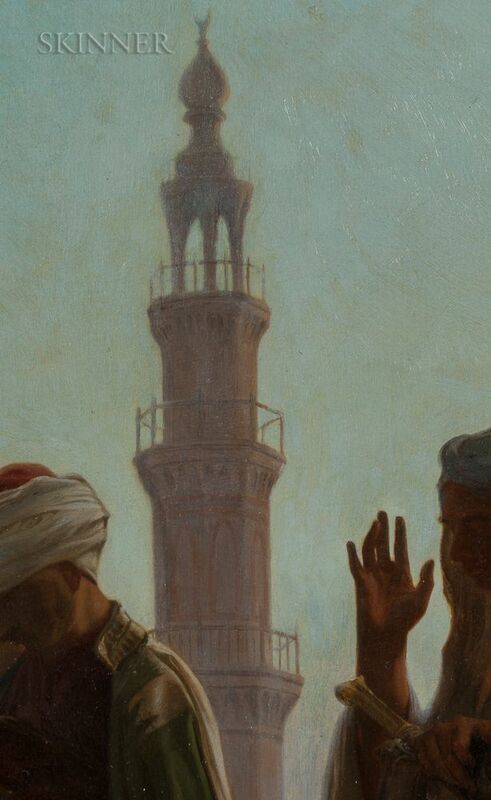 In Cairo, he accumulated a virtual library of souvenirs, costumes, and local crafts, as well as photographs, sketches, and drawings, which served as inspiration for his studio works. 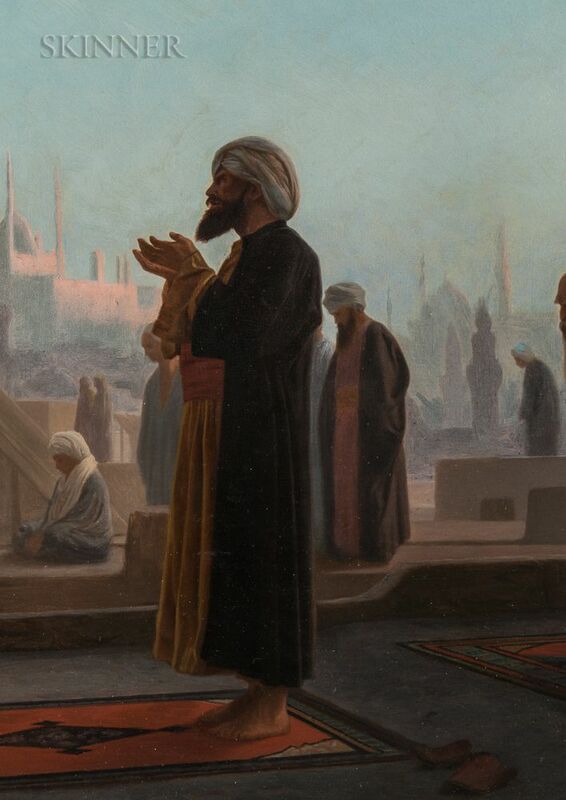 Subsequent trips to the region made during the 1860s and 1870s expanded his repertoire of subjects, confirming his talents as an ethnographer and his reputation as a privileged witness to all aspects of Middle Eastern life. 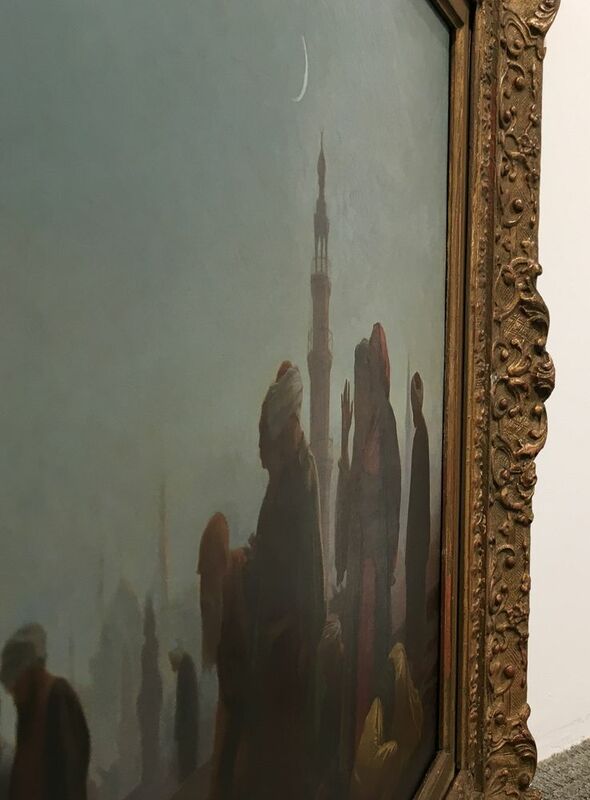 Such artistic liberty did not diminish the overall popularity of Gérôme's Middle Eastern works, nor jeopardize their worth. At least three painted versions of the present subject are known, and numerous reproductions and copies were made during the course of the artist's career - a testament to its success. (8) The original painting in the Hamburger Kunsthalle, exhibited at the Paris Salon in 1865, shares many of the same features with the present picture, including its formidable size. It is the differences between the two, however, that are most important here: In the present work, the absence of background figures and the substitution of a striking man in red - a favorite model of the artist's - serve to focus all attention on the devotions of the group, and the poetry of prayer. The appearance of Evening Prayer by 1870 in two prominent private collections in England and, fifteen years later, on the East Coast of America, was in keeping with the history of many of Gérôme's best-known works. (13) In 1859, Gérôme signed a contract with the French publisher and art dealer Adolphe Goupil (1806-1893). Goupil's calculated marketing of Gérôme's works, through both the sale of originals and affordable, mass-produced reproductions, guaranteed their widespread distribution, and the growth of his international success. The industrial and commercial booms of the nineteenth century also had a critical role to play. They generated a new group of art purchasers and patrons in these countries, who were eager to prove the sophistication of their nouveau riche tastes. 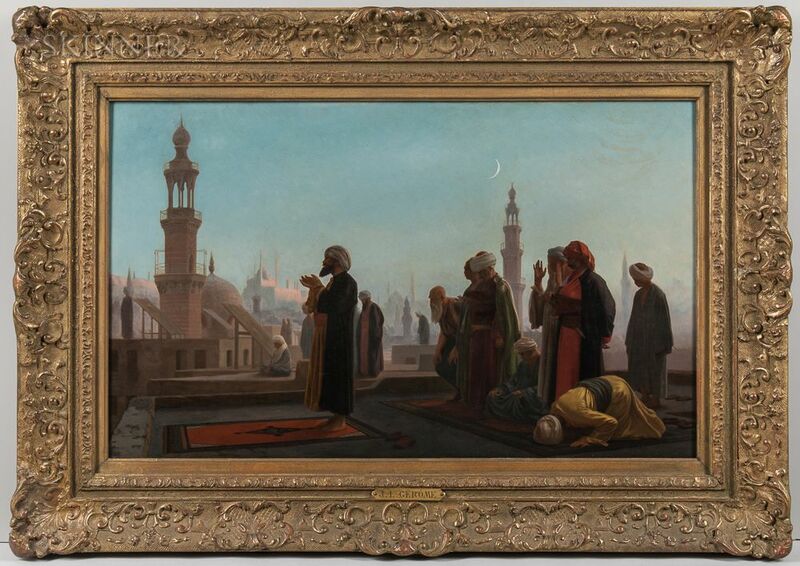 Scenes of Middle Eastern prayer such as this one offered a broad and somewhat ironic appeal: In addition to reflecting - despite their foreign guise - the familiar moral principles that these new collectors were anxious to uphold, they could also offer hope and comfort at a time of rapid change. As the corruptive influences of capitalism were beginning to be recognized and the complexities of modern life were starting to take their toll, the idea of a pure and unquestioned faith was doubtless reassuring. 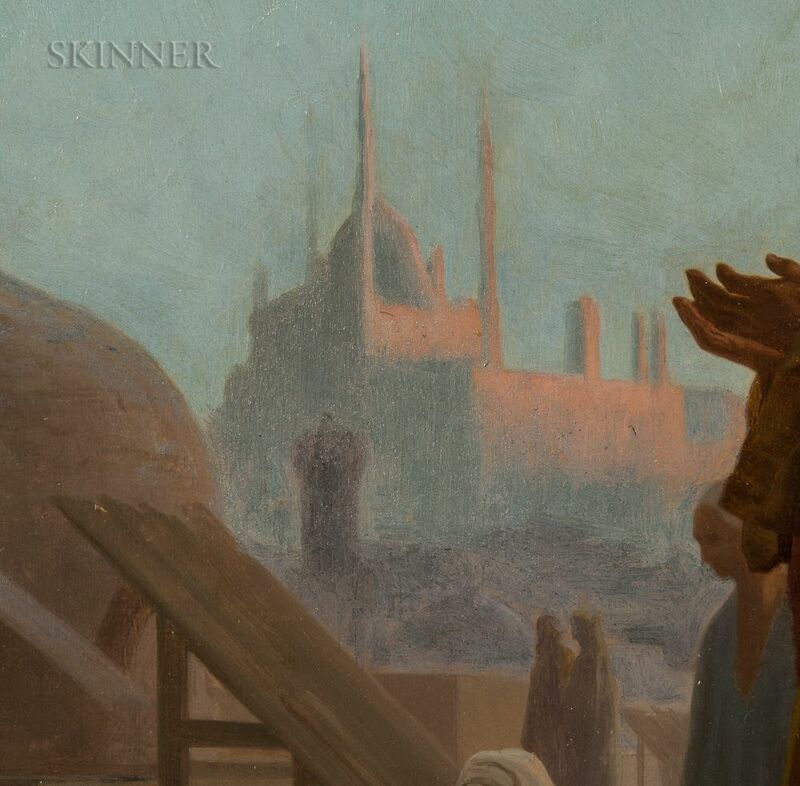 Gérôme's Evening Prayer then, a window into a distant and exotic world, may also, in this context, be read as the final solemn sermon to one closer than it seems. This catalogue note was written by Emily M. Weeks, Ph.D.
1. 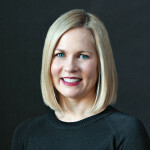 A letter of authentication from Emily M. Weeks, Ph.D. will accompany this work. The painting will also be included in Dr. Weeks's revision of the artist's catalogue raisonné. 2. 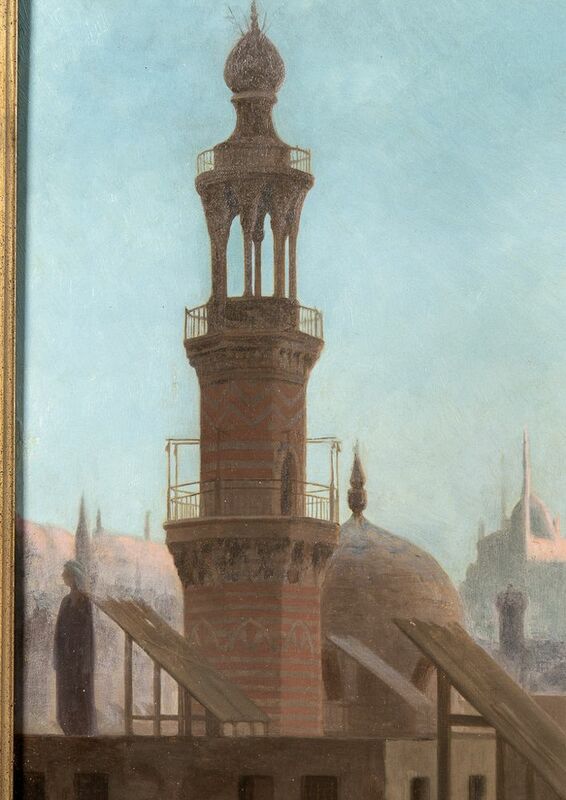 In addition to his own experiences in Egypt, Gérôme may have been influenced in his choice of subject matter by his friend and fellow Orientalist Alexandre Bida (1813-1895): Bida apparently showed the artist his drawing of Prayer on the Housetops (Walters Art Gallery), to which Gérôme responded, "I have done nothing to equal this," (R. B. Gruelle, Notes: Critical & Biographical: Collection of W. T. Walters, [Indianapolis? ], 1895, p. 193). 3. The setting is intended to be the Qasaba, near the Bayn al-Qasrayn. 4. Cf. Lane, 1860 (definitive edition), pp. 75-9. The men's costumes, on the other hand, draw from a far more personal source: the closetful of clothing and accessories that the artist had acquired while abroad. 5. See Caroline Williams, "Jean Léon Gérôme: A Case Study of an Orientalist Painter," in "Fantasy or Ethnography? Irony and Collusion in Subaltern Representations," edited by Sabra Webber and Margaret R. Lynd, special issue, Papers in Comparative Studies 8 (1993-94), p. 121; and David A. King, "Aspekte angewandter Wissenschaften in Moscheen und Klöstern (Teil I)," Berichte zur Wissenschaftsgeschichte 18 (1995), pp. 90-1. 6. 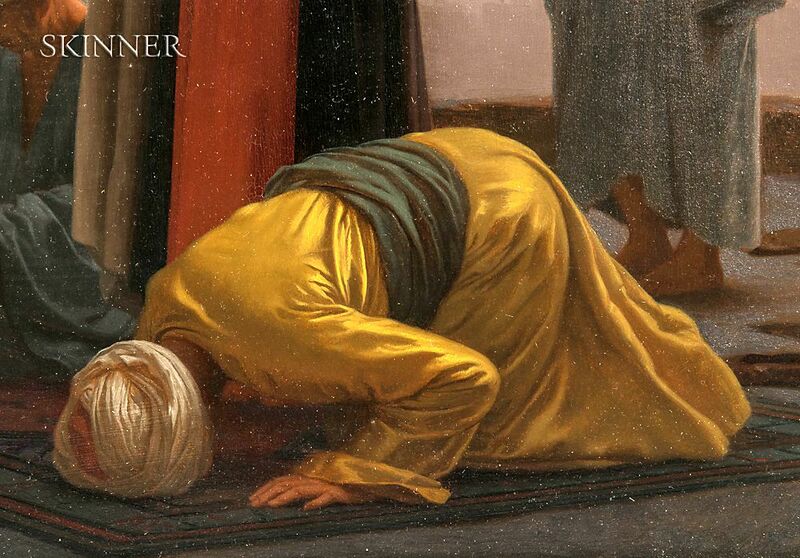 The kneeling figure on the right, for example, forehead to the ground, reappears in the same golden yellow robes in Prière dans la mosquée (art market, currently with Gallery 19c) of 1875. 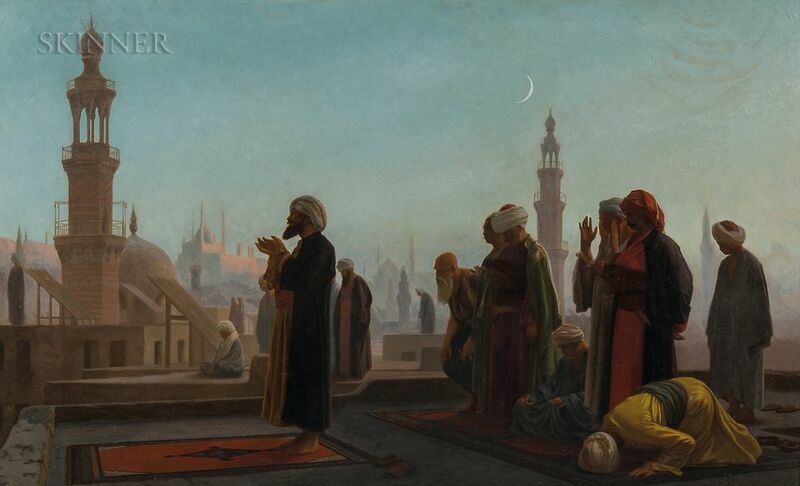 The imam, or leader of the prayer at far left, makes another appearance in Gérôme's The Muezzin of 1866 (Joslyn Art Museum), and its many variations. 7. In addition to personal preference, Gérôme's deviations from reality were also based on marketing considerations and client requests. In a letter to the dealer Knoedler, the artist explained: "Prayer in the Mosque had been reserved by Monsieur Simon and I remember that he made me put a figure facing the spectator, by saying that since all the others were seen from the back or in profile, it would not sell. I did as he wanted because his reasons were commercially sound," (Letter to Knoedler, June 8, 1903, Custodia foundation, Fritz Lugt collection, Netherlands Institute, Paris). 8. The three confirmed versions are: a small oil sketch (private collection), a finished oil painting on panel in Hamburg, Germany (see above), and the present work. Most of the printed versions were produced and distributed by the French publisher and art dealer Adolphe Goupil (1806-1893) (see Gérôme and Goupil: Art and Enterprise, exh. cat., Paris, 2000, pp. 23, 119, 154). 9. Reductions were often done for the purpose of graphic reproduction; because exactitude was emphasized over creativity, the execution was often given over to the studio, with the resulting work being only partially by the artist's hand. 10. The artist himself addressed this notion in a letter to the Belgian art dealer Ernest Gambart (1814-1902): "The alterations that I have made from the original picture [The Duel after the Masquerade, 1857-9, Walters Art Museum] have singularly improved this composition, especially in its general aspect . . . and I regret not to have thought of it at first when I executed the original" (Hering, Gérôme, p. 75). 12. 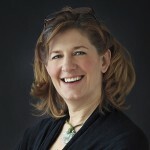 The photographic quality of these works has long encouraged their interpretation as "factual" - for better or for worse. For more on this subject, see Emily M. Weeks, "A Veil of Truth: The Art and Artistry of Jean-Léon Gérôme (1824-1906)," Private Journey Magazine (January 2011); and "A Veil of Truth and the Details of Empire: John Frederick Lewis's The Reception of 1873," Art and the British Empire, edited by Tim Barringer, Geoff Quilley, and Douglas Fordham (Manchester and New York: Manchester University Press, 2007), pp. 237-53. 13. Samuel Mendel (1814-1884), called the "Merchant Prince," was a wealthy textile merchant from Manchester, England. His collection at Manley Hall was widely known and documented. Henry William Ferdinand Bolckow (1806-1878), of Middlesbrough, England, was a prominent industrialist and Member of Parliament. William Peddle Henszey (1832-1909), a Pennsylvania railroad baron, was a member of numerous clubs and associations, and a major supporter of the arts. 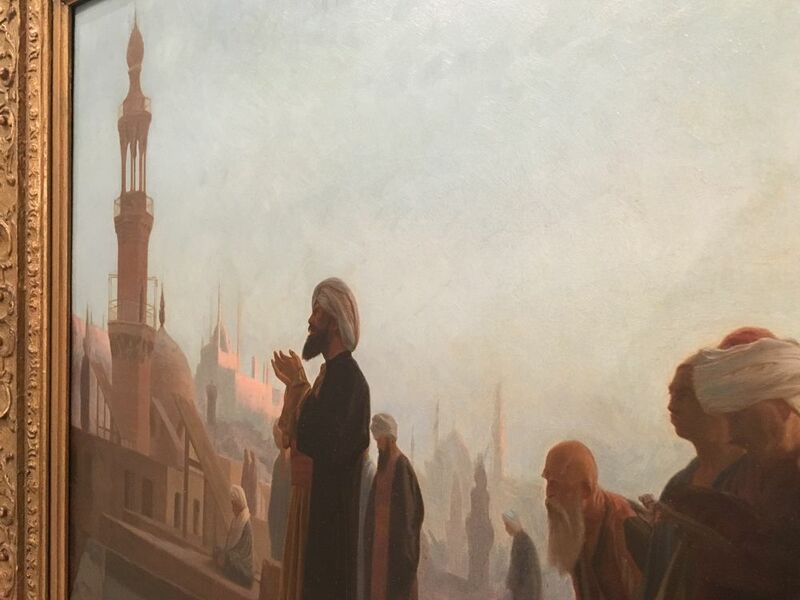 His residence, called "Redleaf," was filled with significant artworks, including the present painting by Gérôme. For more on Gérôme's popularity in America, see Emily M. Weeks, "An Enduring Renaissance: Collecting Gérôme in America," Gérôme, exh. cat., Gallery 19c, New York, 2017. 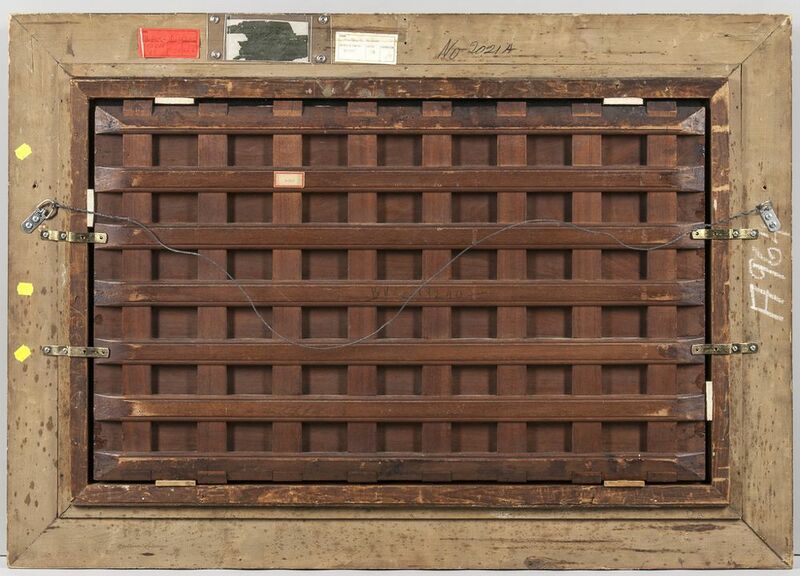 Handwritten in black ink across the center horizontal bar "BVC -19240-" and with a gummed label also on the back of the panel with the typed number "H-513"
The painting was treated at Buffalo State College in 1997. 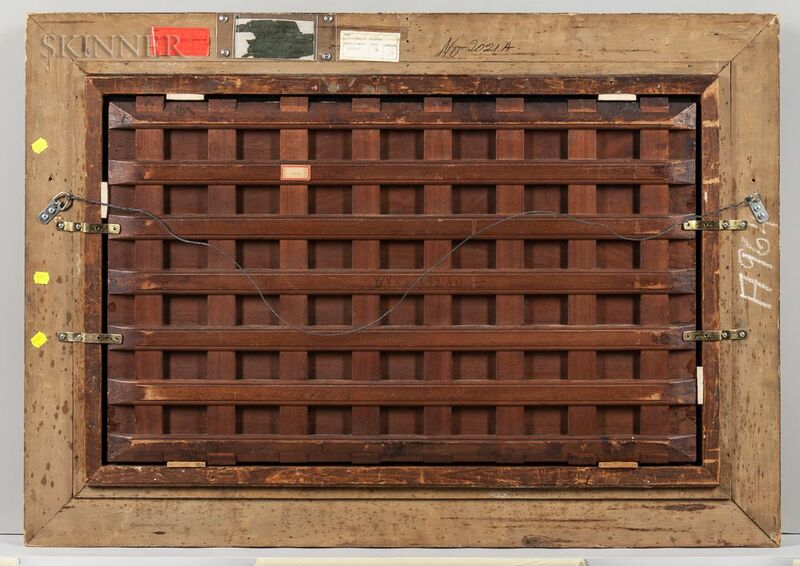 Conservators removed and encapsulated the label which had been on the reverse of the frame. 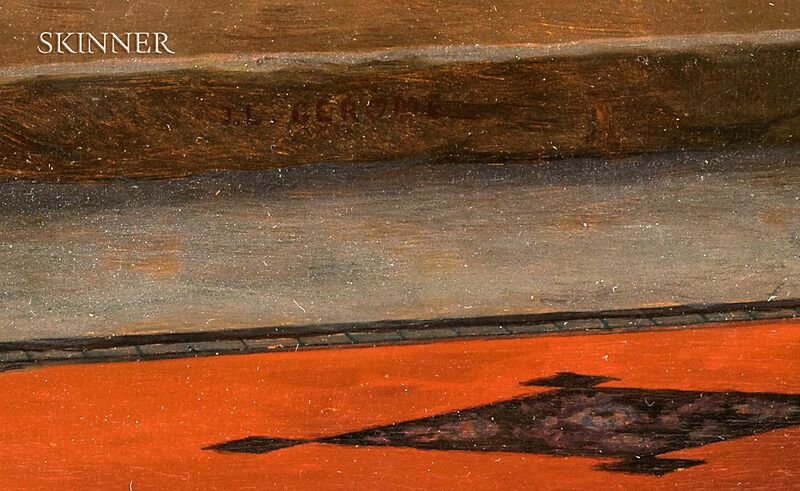 Old varnish, which suffered discoloration and craquelure, was removed, as was old in-painting. The painting was then re-varnished, treating paint losses and abrasions along the edges and in the sky using Polyfix, and the fills, abrasions and discolored residual repaint were in-painted. A conservation report accompanies the lot. 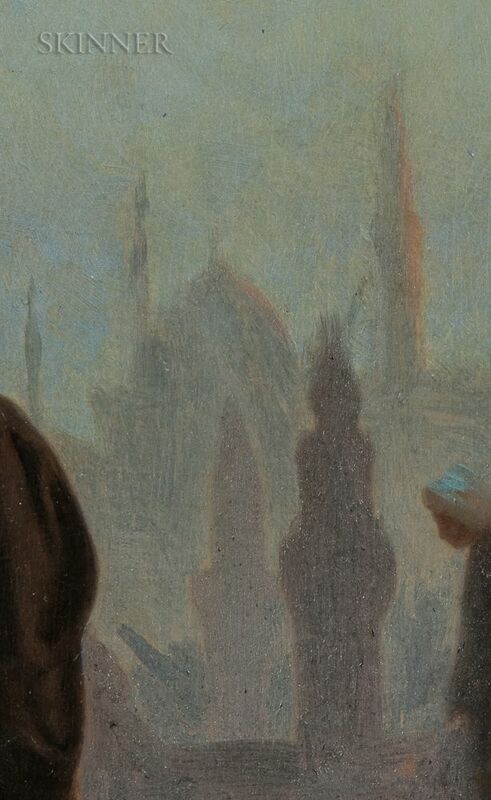 Some muted fluorescence to the tower on the far left, which may be natural pigment fluorescence from the brown pigments. No mention of retouch in this area was noted by the Buffalo conservation report. The cradle looks to be 19th century and any curvature to the panel is extremely subtle.